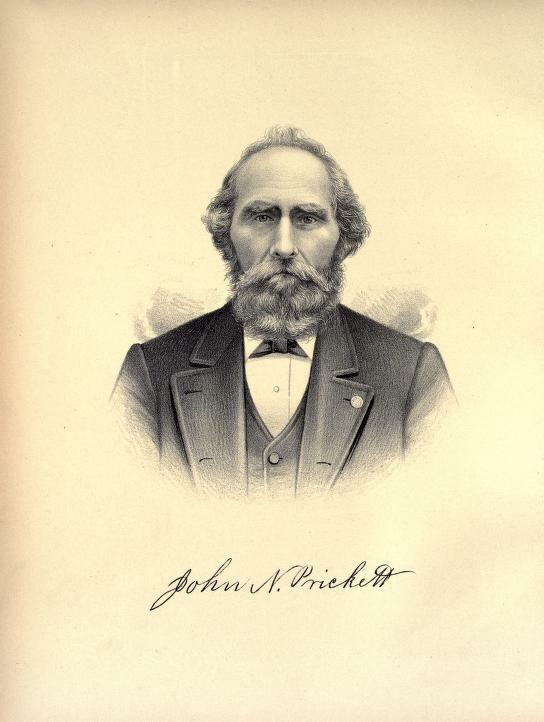 JOHN N. PRICKETT. Our subject is a farmer living near Sorento and a veteran of the late war. He was born in Bond County, near Greenville, December 24, 1826, and was the second oldest of a family of four children born to John and Anna (Holbrook) Prickett. The latter was born in Georgia April 8, 1801, and died December 30, 1885. Mr. Prickett, Sr., was also a native of Georgia and came to Illinois in an early day, but died when our subject was a lad of, seven years of age. Mrs. Prickett again married, her second husband being John E. Evans. Of the four children born to our subject's parents, James R. is in Washington, and Jacob T. in Litchfield, this State; Thomas W. Evans, a half-brother of our subject, lives nearby. He is also a veteran of the late war, having served in the One Hundred and Fiftieth Illinois Infantry. John N. was reared on the home farm, and there learned many things besides the rudiments of the education which he received in the district school. He was engaged for a number of years as a teacher in the schools of the locality. September 5, 1861, he entered the army, joining Company A (an independent company of sharpshooters), which was attached to the Twenty-sixth Missouri Infantry. This company was for a time body-guard to Gen. Fremont. They took part in the battles of Iuka and Corinth. After the latter engagement our subject was taken sick with a complication of diseases and was for a long time in a hospital at St. Louis, from which he was finally discharged January 6, 1863. February 3, 1865, Mr. Prickett had so far recovered that he again enlisted in Company G, One Hundred and Fiftieth Illinois Infantry, having a commission as Orderly-Sergeant. He was afterward promoted to the post of First Lieutenant of his company, and served until January 30, 1866, when he received his honorable discharge at Camp Butler, at Springfield, Ill.
After our subject returned from the army, he took unto himself the duties and obligations of married life, his bride being Miss Julia A. Denny, a sister of O. C. and E. W. Denny, whose family came to Illinois in pioneer days. Mrs. Julia Prickett died January 18, 1878, leaving three children, one of whom died in infancy. Willie S. married Miss. Nellie M. Linxwiler; Addie lives with her father. Our subject again married, June 9, 1881, his present wife having been Miss Nancy S. Wiley, who was born in Montgomery County, where her parents were early settlers, coming hither from Kentucky. Her father, James Wiley, was born in Lincoln County, Ky., and her mother in Buncombe County, N. C. The decease of both took place in Montgomery County. Mr. Prickett is a strong Republican and is a practical exponent in his agricultural interests of the benefit reaped from the policy of that party. His associations and reunions at various times with the Grand Army of the Republic have given him great pleasure. For many years he was engaged in teaching. He now lives on his farm, still retaining enough of its active management to be a pleasant occupation for him. 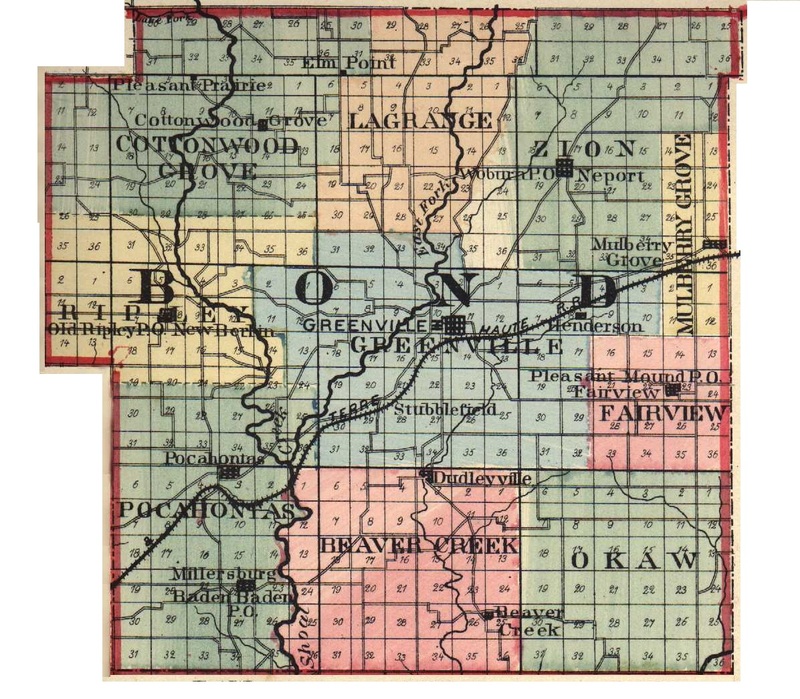 Extracted 20 Dec 2016 by Norma Hass from 1892 Portrait and Biographical Record of Montgomery and Bond Counties, Illinois, pages 294-295.